“This disc is a single-composer study, of which it can be said that some items are better examples of his work than others. Two works on this disc show Part’s tintinnabuli style in full bloom. “Miserere” itself is over thirty minutes long, and by far the best item in the programme. A setting of Psalm 51 in Latin (the same text as set in the famous Allegri “Miserere”) with verses interpolated from the “Dies Irae” of the Missa pro Defunctis, this work shows how Part’s style can magically draw a wealth of emotions from the simplest of musical concepts. Indeed, the work opens with the barest of motifs: the words of the psalm are chanted on three notes by a high solo tenor, interspersed with triadic statements (the so-called tintinnabuli pitches) on clarinet, and moreover bound together with distinct silences. This develops as the text unfolds: a solo counter-tenor joins the tenor in a haunting duet; meanwhile the instrumental ensemble expands to include other woodwinds and organ, all of which offer what appears to be a delicate wordless commentary. 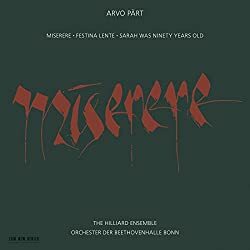 An abrupt change of pace comes with the “Dies Irae” verses, sung by a four-part chamber choir with massive, apocalyptic statements from woodwinds, brass, organ, percussion and electric guitars (!) – yet all is in the same style as the opening. After this massive outburst of terror, the opening discourse returns, sung by soloists (soprano, counter-tenor, two tenors and a bass). The interplay of voices and instruments carries the text forward in strikingly beautiful and sensitive ways. The work ends, in pure penitence and supplication, with a further choral statement, this time sung with heart-rending quietness: the “Rex tremendae” verse of the “Dies Irae,” bringing the work to a close. It truly is one of Part’s masterpieces – a proof that the extreme simplicity of the tintinnabuli style need not be limited to small-scale works, and can indeed break free of sounding annoying or repetitive. Recorded here in a very generous acoustic, played and sung with clarity and gravity, and carrying a beautifully sustained emotional weight, this is a definitive performance – a real gem. The other tintinnabuli work (track 2) is “Festina lente” – “hurrying slowly” – which is scored for string orchestra and harp and makes use of the mensuration canon technique employed by the composer in “Miserere” and other works. This is a softer and more direct piece than “Miserere,” but the effect is refreshing after the profound writing of the former – and like “Miserere,” it is sensitively performed here. The last work on the disc may at first seem off-putting. “Sarah was ninety years old” was composed just prior to Part’s formation of tintinnabuli (he had previously written serial music, like that of Schoenberg). It is a minimalist piece – the first four minutes or so feature nothing but a single drum, played with two beaters to produce alternating timbres of sound. These timbres are hacked out in a single rhythmic pattern that never seems to end: this is said to symbolise the ninety years of barren life lived by Sarah, wife of Abraham in the biblical book of Genesis. Presently, two tenors enter with an array of chords, cycling around each other and also set to a basic repeating rhythm. After more knocking from the drum and more very simple vocal droning, the organ enters, massive yet restrained, and an ecstatic solo soprano takes up the wordless narrative – Sarah conceives a child, the first of many that became the Israelites in the Genesis story. At first hearing (and perhaps several subsequent ones) this piece will seem dull and pointless; it does have a remarkable meaning, however, and it is quite gem-like even as it is barren and seemingly devoid of musical content. Arvo Pärt pichando a neve.